–Millennium Park located at 280 Romence Road in Portage, offers ice skating during the winter. 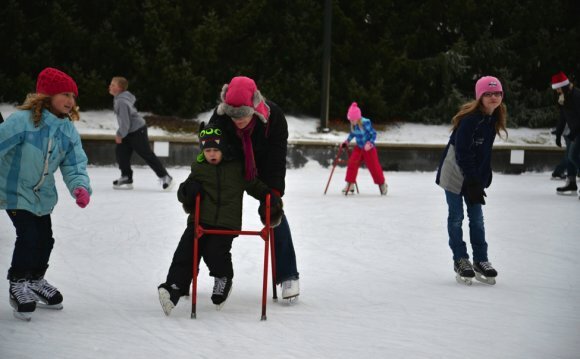 The rink season starts in mid-December and runs through March 1. For a modest fee, you can rent figure or hockey skates. They also offer skating “walkers” to help the young ones learn how to skate. It’s a wonderful outdoor skating venue whether you have been skating for 50 years or just learning how to skate. They also offer refreshments for purchase and a warming room. Tubing at Echo Valley –We love tubing at Echo Valley. Their tubing hill offers a good mixture of fun and excitement. Located at 8495 East “H” Avenue, Kalamazoo, Echo Valley is open from December 20 through the second week of March 2015. While you’re there, you can take a ride on the toboggan run or try ice skating. There is a lodge where you can get hot chocolate and other refreshments to warm up. Echo Valley is a great place to go for family fun. Maple Sugar Festival is on March 14 & 15 at the Kalamazoo Nature Center. This is a family-friendly and educational event that we go to every year. This year is their 50th Annual Maple Sugar Festival. Start your day with delicious pancakes smothered in real Michigan maple syrup! Go back in time as you walk along a wooded trail with a Naturalist for a historical maple sugar tour. Or experience the amazing Birds of Prey up close! The whole family will enjoy the sweet experience.